Gibbons are the smallest members of the ape family, weighing between 12 to 22 pounds. 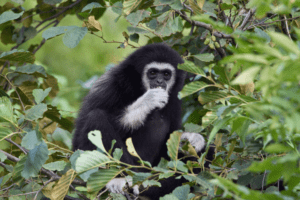 In early 2017, it was announced that a new species of gibbon was found in China. There are now 17 different species, all native to parts of Southeast Asia, southern Asia, southern China, northern India, and Bangladesh. Gibbons are the only monogamous apes. In nature, each gibbon family inhabits and defends its own territory. 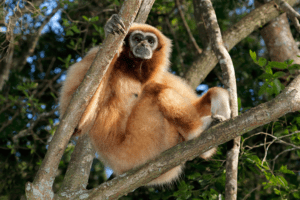 Young gibbons grow up with their parents but get evicted when they are between five to eight years of age. Once on their own, they move on to form a new pair, in a new territory, with another “evicted” gibbon. 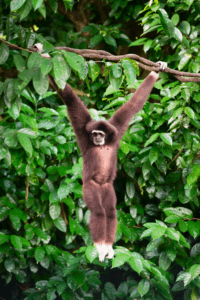 Gibbons have very long arms and move around by arm-swinging (“brachiation”). They are famous for their acrobatics and can move through the trees at up to 35 miles per hour. Most gibbon species sing beautiful songs.  At IPPL, most of our females (who are members of the white-handed species) sing the “great call”, while the males provide the backup vocals. Throughout the day, we are privileged to be serenaded by our very own gibbon choir.